A rare panoramic view of Alexandria. The second largest city and the main port of Egypt, Alexandria was built by the Greek architect Dinocrates (332-331 BCE) on the site of an old village, Rhakotis, at the orders of Alexander the Great. The city, immortalizing Alexander's name, quickly flourished into a prominent cutural, intellectual, political, and economic metropolis, the remains of which are still evident to this day. 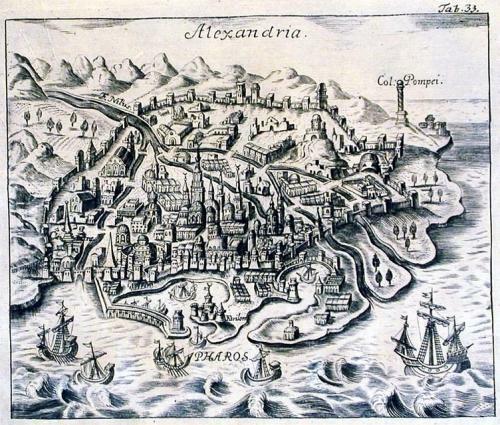 But long before Alexander the Great visited the site of Alexandria, Homer had written about Pharos in his Odyssey. What remains of the prehistoric harbor have been found off the shores of the island, now the peninsula of Ras-El-Tin. Opposite Pharos, on the Egyptian mainland, was a small village centered around the area where "Pompey's Pillar" now stands. It was called Rhakotis. From a book by A M Myller recounting his travels from 1725 to 1727. Myller journeyed from Rome to Jerusalem then on to Troy, Gallipoli and Constantinople. From Constantinople he travelled to Egypt and then to Syria. Finally from Syria he travelled to Malta and back to Rome. Scarce.